MotorStorm: Arctic Edge is the third iteration in the Playstation's over-the-top Burning Man-meets-World Rally Championship driving series since it was unveiled among a slew of Playstation 3 launch titles in 2005. The snow and ice setting of this latest MotorStorm, a shift from the arid desert of the first title and the humid jungles of the second, adds plenty of new twists. But the biggest change is how you'll play the game: On your Playstation Portable. Can a franchise built on the premise of pushing the bounds of the PS3 succeed on a portable platform more similar to the Playstation 2? Smooth Operator: Played on the PSPgo, MotorStorm: Arctic Edge still delivers a lively experience with intuitive and responsive controls. You'll still find the gas and brake, the emergency brake and nitro all easy to use while shifting through packed courses and drifting around hair-pin turns. The ability to use either the thumbstick or the direction pad to steer is a nice addition as well. Diminutive Deaths: One of MotorStorm's biggest draws for me was the use of rag-doll physics and a detailed spray of car parts every time I screwed up at high speeds. While Arctic Edge has certainly cut back on the car parts, the physics are fully in play during the game, delivering satisfying, groan-worthy crash-ups and body defenestration. Memorable Maps: MotorStorm: Arctic Edge comes loaded with a dozen hazard-packed, multiple-route tracks, all of which you will eventually race on in both directions. The maps are nicely detailed, coated with patches of ice, flowing water and even some vision-hindering snowfall, making the races feel more open-ended and alive. Avalanche! : During the course of some races a racer can trigger an avalanche by using their vehicle's horn too much or crashing in the wrong place. The results sometimes alter tracks, but almost always clear the area of all racers in a tumble of snow and ice. Expanded Cool Down: MotorStorm: Pacific Rift introduced the idea of cooling down your nitro-heated engine by driving through water. Arctic Edge expands on the idea, allowing you to also use high drifts of snow to speed up cool down. A minor, but nice touch. Screen Cap: At any time while playing on your own, you can pause the game move a camera around and take a screenshot. You can even save that screen to your Playstation Portable for sharing or showing off later. Great idea for community building. Online Mayhem: Once you get online, playing with others over a WiFi setting is a fairly fun experience. With leaderboards, and support for up to six players at a time, the races are often frantic and the results always have meaning. Getting Online: This may be a very limited issue. But when I tried to get online to play MotorStorm: Arctic Edge the game crashed. Finally, I had to create an entirely new Playstation Network account to get the game to run. While I've not seen any forum or support posts complaining about this issue, GameSpot did mention it in their review as well. Sony tells me this is an incredibly rare problem. If so, then it likely won't impact you. Bubble of Win: I couldn't help but notice that once I got out of view of the pack in single-player races, I often stayed out of view of the pack. It was as if they vanished. Part of me wonders if that's a deliberate attempt at streamlining resources. It didn't kill the experience for me, but it did seem eerie at times. 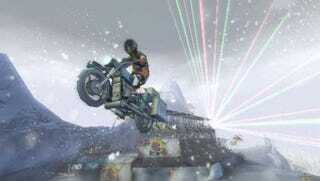 Too Fast, Too Small: MotorStorm: Arctic Edge is an amazing racer for the Playstation Portable. It's surprising how many elements it introduces graphically to each race. Unfortunately, this can sometimes get daunting on a small screen with such a fast game. More than once I missed a turnoff or drove smack into the wall because I simply couldn't see it in time. This game is a prime example of why I like to download games for the Playstation Portable. I'm not sure I'd want to keep this game loaded in my PSP's UMD slot all of the time, but it's nice having it handy. And it's great for a quick session or two to kill time. MotorStorm: Arctic Edge is a handful of fun, a fantastic portable version of the full MotorStorm experience. While it may shave away some of the essence of the console title, it still manages to deliver enough of the full experience to make picking up the game worth your while. MotorStorm: Arctic Edge was developed by Bigbig Studios and published by Sony Computer Entertainment for the Playstation Portable on UMD and as a download on Sept. 29. Retails for $39.99 USD. A copy of the game was given to us by the publisher for reviewing purposes. Played all race modes and tracks in single player with all vehicle classes and multiplayer modes on the PSPgo.